The U.S. Geological Survey budget is receiving a marginal increase in fiscal year 2019, remaining just under $1.2 billion. Congress rejected the administration’s deep proposed cuts across agency programs, while supporting its new critical minerals mapping initiative. 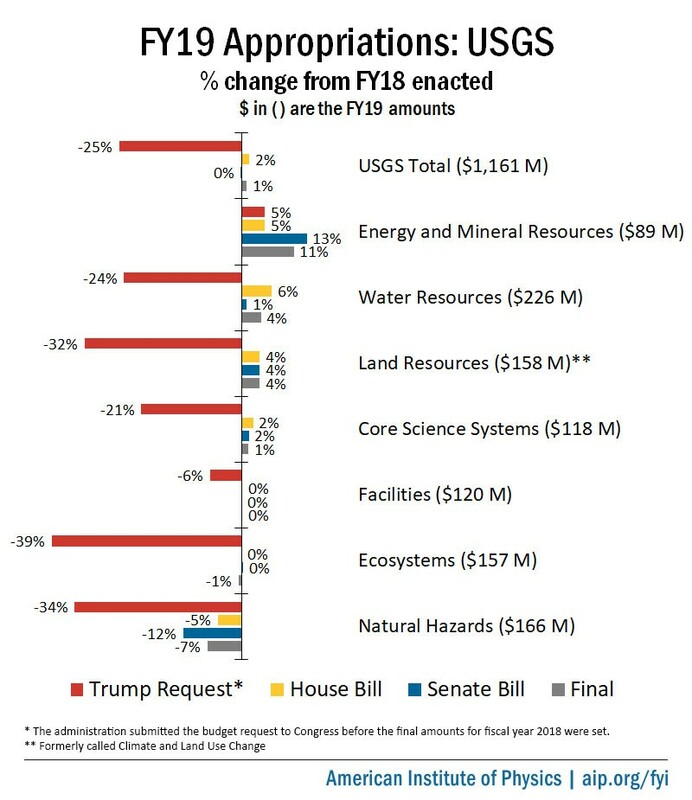 Appropriations legislation enacted last month provides the U.S. Geological Survey with $1.16 billion, a $12 million, or 1 percent, increase over last year’s level. Funding will remain steady or increase slightly for most major agency programs. The main exception is for the Natural Hazards program, which will drop after receiving one-time funding last year to modernize volcano monitoring equipment. Congress also provided new funding for USGS’ efforts to characterize U.S. mineral resources, an administration priority. The legislation is accompanied by an explanatory statement containing policy and funding direction for the agency. Unless negated in the final statement, language from the reports that accompany the House's and Senate’s original versions of the legislation is also valid. Tables detailing final funding levels for agency programs are available in FYI’s Federal Science Budget Tracker. The Mineral Resources program budget will jump 19 percent to just under $60 million in support of a new critical mineral mapping initiative, while funding for the Energy Resources program will decrease slightly to $30 million. The statement specifies $9.6 million for the new Three Dimensional mapping and Economic Empowerment Program (3DEEP), which will support airborne geophysical surveys of regions thought to contain significant amounts of critical minerals. USGS requested $10.6 million for the program to support its implementation of a 2017 executive order to bolster domestic supplies of such minerals. Pursuant to the order, USGS published a list in 2018 that designated 35 minerals as critical to U.S. economic and national security. 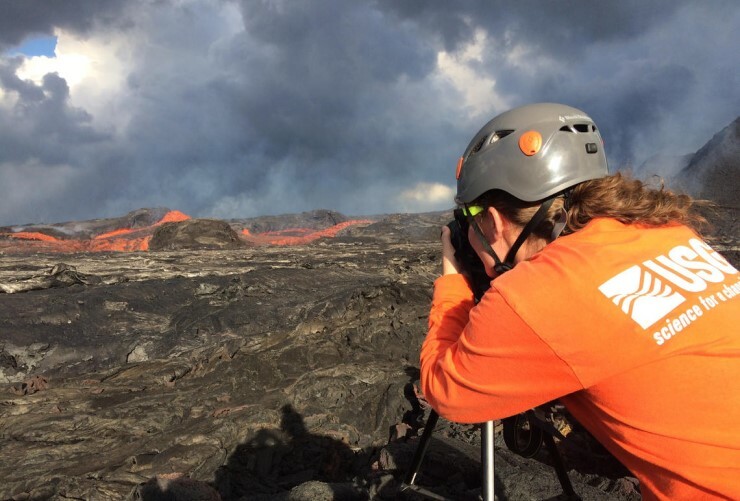 A member of the field crew from the USGS Hawaiian Volcano Observatory monitors the 2018 eruption of Mount Kīlauea. The Natural Hazards budget will drop 7 percent to $166 million, with the entirety of the decrease coming from the Volcano Hazards program budget, which will drop 29 percent to $30 million after receiving a one-time $13.5 million boost last year to repair and replace monitoring systems on high-priority volcanoes. Nevertheless, both the House and Senate reports still raise concerns that existing monitoring systems are “outdated and inadequate.” Accordingly, the final statement specifies that $3 million go toward “next-generation lahar detection system infrastructure on very high-threat volcanoes.” The total program budget falls short of the $55 million that Congress recently recommended USGS receive to develop a National Volcano Early Warning and Monitoring System. The Earthquake Hazards program will remain level at $83 million after receiving a 30 percent boost last year. The legislation rejects the administration’s proposal to halt development of an earthquake early warning system for the West Coast known as ShakeAlert, instead providing $16 million for development costs and $5 million for capital costs associated with the buildout of the system. Last year the project received $13 million for development costs and $10 million for capital costs. The House and Senate reports also lament the lack of “real-time instrumentation” available for monitoring the Cascadia subduction zone in the Pacific Northwest and express support for developing an early warning system in the region. The final statement further specifies $5 million for infrastructure upgrades to the Advanced National Seismic System, which monitors earthquakes nationwide, as well as $2 million for purchasing seismometers from the National Science Foundation’s USArray project and integrating them into the system. Sen. Lisa Murkowski (R-AK), who chairs the appropriations subcommittee for USGS, has previously pressed the agency to adopt seismometers that were temporarily deployed in Alaska as part of the NSF project. The Landslide Hazards program will receive level funding of $4 million, with the Senate report directing USGS to develop a research strategy for identifying at-risk communities in each state. The final statement also specifies level funding of $2 million for the Geomagnetism program, which the administration proposed to terminate. In rejecting the proposal, the House report highlighted the program’s contributions to space weather preparedness. The Land Resources budget will increase 4 percent to $158 million. Called Climate and Land Use Change prior to a budget restructure last year, the Land Resources program supports a set of climate change research centers and remote sensing research enabled by the Landsat series of satellites. The final statement specifies that development of the ground control systems for Landsat 9 are “fully funded” at $42 million. USGS is developing the satellite in partnership with NASA, which is responsible for building the spacecraft for its 2020 launch. NASA likewise received its requested funding for the satellite, $162 million. The Climate Adaptation Science Centers program will receive $25 million, with the final statement noting that the legislation “continues funding for the eight regional science centers at the fiscal year 2018 enacted level.” The administration had proposed to reduce funding for these centers by $11 million and “realign” their mission. The final statement also specifies $5 million for “interim office and laboratory space, equipment, and other needs due to the destruction of the Hawaiian Volcano Observatory and the continuing volcanic activity at Kilauea.” It also encourages the Interior Department to “consider collocating damaged USGS facilities in a lower risk area” as part of the rebuilding plan.